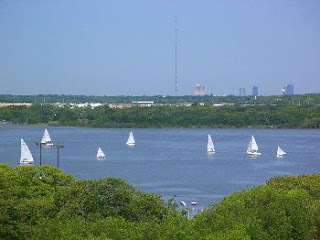 I love my house because it is near a lake. I don't like when it becomes a lake. Over the past week we've been experiencing torrential rain because of hurricane season. The street I live on slopes down. My house is towards the end of that downward slope and catches the water draining from the homes up the street. 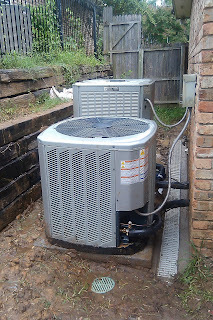 Unbeknown to me the draineage system that had been working until now was disturbed when I replaced my a/c unit. The new a/c blocked the path the water was taking out of my yard and into the street. Needless to say, after one of those good storms we've been having my family room, laundry room and on of the bathrooms started flooding. The wood floors started curling up and every time I took a step the water spout out from in between the boards like one of those floor water fountains you see in public parks. The outside was no better. 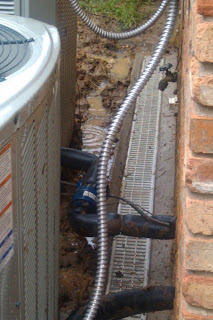 The area between the fence and the a/c units was a lake several inches deep. Todd and I had to stand in the mudd and water and try to clear a path for the water to go down to the drain. My feet were drenched. Heck, my whole body was muddy and wet. I had more moschito bites that I can count. I saw a water snake swimming around. And, after all of that, I had to take care of the problem by myself because Todd had to leave for Scout camp. I was miserable! Luckly thanks to my mom I was able to find a qualified contractor that took care of the problem over the fourth of July weekend. All of last week I kept praying that the rain would stop so I could limit the damage to the interior of the house and take care of the problem outside. After the drain system was put into place, I've been praying for rain so that I can test that it is working properly and take care of my floors. Finally today it started raining hard. I'm pleased to report that the drain has been catching the water and pusing it out to the street. What a relief.